The awards recognize the breadth and depth of SweetRush’s content development services, including mobile learning, games, video, performance support, social learning, blended programs, and sales training. 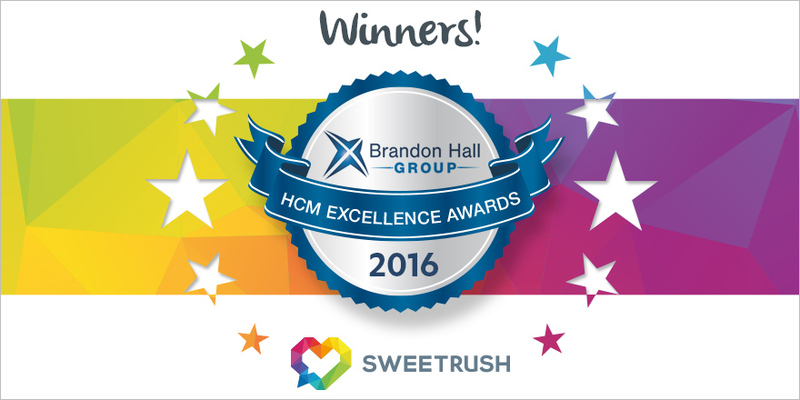 San Francisco, California., September 7, 2016 — Brandon Hall has announced the winners of the coveted HCM Learning and Development Excellence Awards 2016, and SweetRush Inc. won nine awards, including seven gold, placing the company among the top overall award winners. The winning award categories include mobile learning, games, social learning, video, performance support, and sales training. SweetRush shares its awards with its clients: global, world-class companies Cisco Systems, Inc.; Hilton Worldwide; and Bridgestone Americas, Inc. The winning projects include an engaging large-scale sales training program, an innovative soft skills learning program for engineers, a sophisticated mobile learning game, and compelling training videos. “The bar for Brandon Hall Group Excellence awards is high, and to bring home the gold in such a large number of categories highlights our strengths as a partner in learning and development. Each and every one of these projects—be they mobile, gaming, social, video, or a blend—was built on excellent client collaboration and trust, creativity, innovation, and a strategic approach from analysis to evaluation,” said Arturo Schwartzberg, Co-founder and Chairman of SweetRush Inc.
A panel of veteran, independent senior industry experts and Brandon Hall Group senior analysts and executives evaluated the entries based upon the following criteria: fit the need, design of the program, functionality, innovation, and overall measureable benefits. With more than 10,000 clients globally and 20 years of delivering world-class research and advisory services, Brandon Hall Group is focused on developing research that drives performance in emerging and large organizations and provides strategic insights for executives and practitioners responsible for growth and business results. Visit their Brandon Hall website for more information.